In each of our lives there comes someone who significantly affects us. 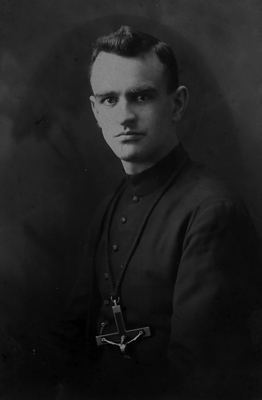 One instance of this is the Canadian, His Excellency Bishop Joseph Cyprian Bonhomme (1889-1973), o.m.i., Titular Bishop of Tulana, former Vicar Apostolic to Basutoland (now Lesotho), Bishop-Assistant at the Pontifical Throne (Assistant au Trône Pontifical), and holder of the O.B.E..
Bishop Bonhomme produced a large amount of written material over the course of his career, among which was a genealogy of his family, produced in very limited numbers in the early 1950's. In 1994-1995, this genealogy was edited, translated, and brought up to date by Suzan Schmekel in consultation with one of Bishop Bonhomme’s nieces, some of his cousins in the Ottawa region, and extensive genealogical and archival research. This English edition was published in 1995 as The Bonhomme Family (1632-1995), by The Paquette Press (Ottawa ON). This text went out of print, and Suzan Schmekel chose to undertake an updating of the genealogy to the year 2015. 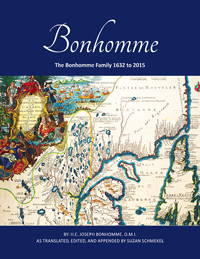 The new edition of the book is The Bonhomme Family (1632 to 2015). This 240 page monograph is published by Paquette Press, CTG Publishing (June 8, 2017) and is available either as a Kindle e-book or in hard copy through Amazon.com. To sample the book you are invited to read the extract that includes: 1-Translators Note, 2-table of Contents, and 3-the Historical Note. The purpose of this project is to provide the modern reader, or historian, with information about the life and work of Bishop Bonhomme, for his life is an example of creative management and practical spirituality in the work place in trying circumstances. While it is true that we are all creatures of our time, there is the possibility to transcend the time in which we work and live. I believe that there are lessons that can be drawn from Bishop Bonhomme’s life that can be useful to managers, and to individuals, today and in the future. As I can, I propose to write about the Bishop, and may not have a book as such for several years given the demands of my consulting practice. However, on this site, the reader can explore aspects of the Bishop’s life and work. One way to explore the Bishop’s life and work is to spend a few minutes with him and his colleagues in 1934 Lesotho (then called Basutoland) through a video taken in 1934. Watch the video now. One by-product of this project was to assist a group in St-Camille, Quebec (the birthplace of Bishop Bonhomme), develop a memorial site to the Bishop and to his family. The Bonhommes were one of the first families to homestead St-Camille. An explanation, and photos of the opening of “Place Mgr Bonhomme” have been added to this website. This is a work in progress, and if you are a Bonhomme descendant, have something you would like to contribute, or simply interested in the history of this family, its members, you can join the Facebook Bonhomme Family Group (contact me and I’ll give you an invite). And I am always willing to assist.